Sundae Bingo Casino will then reward you with a bonus (Welcome Bonus is for new players only). 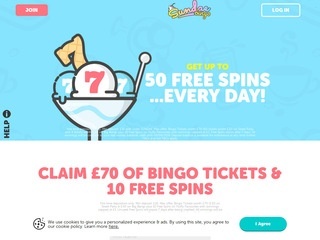 The terms and conditions of the bonuses vary between different casinos and might also change over time and between different countries, so it is important to compare the different offers and read the T&C for Sundae Bingo Casino before signing up. Sundae Bingo Casino is a fresh release launched in 2018 by 888 Holdings’ subsidiary Cassava Enterprises Gibraltar Limited. A self-proclaimed “tasty treat for everyone”, this online gambling venue is not only beautiful but also as safe as can be. Importantly, it is regulated and licensed by the UK Gambling Commission (UKGC) and Malta gaming Authority (MGA), which vouchsafes for the site’s security, reliability and trustworthiness. What is more, Sundae Bingo is audited by the eminent agency eCogra, which again proves that this site is playing no games when it comes to your safety and protection. Furthermore, it is a both instant play and mobile online gambling firm, so you can enjoy gambling on the move, provided that you have a decent Internet connection, an iPhone or an Android smartphone. Sundate Bingo Casino’s offering is run on Dragonfish platform. The games, which are limited to Bingo titles and hundreds of slots, come from some of the biggest names in the iGaming industry such as NetEnt, NextGen Gaming, Big Time Gaming (BTG) and Thunderkick, which means complete diversity and quality games. This might be a surprise to you since we have been talking about a Bingo-oriented site. Sundae Bingo Casino takes pride in well over 300 slots! We are not kidding. At Sundae you can revel in a mass of progressive jackpots, video slots and classic slots, all varying in rules, themes and styles. In these cold days you can remind yourself of summer, sand and waves and play on 99 Time, Caravan to Cairo or Rio Fever. Not for scared cats! Sundae Bingo Casino possesses an ample selection of horror-inspired titles such as Bloodsuckers, Halloween Jack, Pay of the Dead and Dr Jekyll Goes Wild. Classics like Berry Burst, Starburst, Golden Goddess and Shaman’s Dream are also featured. The tasty online casino does not host any table games at the moment. Do, however, take a moment and pay a visit to its slot section for endless fun! 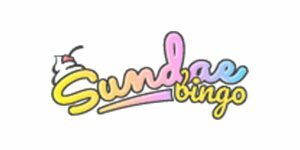 Sundae Bingo guarantees the best Bingo games around! At this delicious online gambling establishment you can enjoy a wide diapason of popular Bingo variants all capped with the interactive ambiance the venue has catered for. You can play on 75 Bal Bingo and 90 Ball Bingo anytime you feel like it. You are even enabled to chat with your fellow players and enjoy the true feel of gambling from the comfort of your home! Live dealer games are not something you will find at Sundae bingo Casino for the time being. Banking has been dealt with smoothly at Sundae Bingo Casino. The online gambling venue boasts what its clients refer to as “fantastic reward system”, thanks to which basically you have absolutely no wagering requirements and all winnings are paid in cash! Sundae Bingo Casino offers a wide range of banking options that include numerous ewallets, credit and debit cards, bank wire transfer and pay by phone service. Ewallet-wise, your options include Neteller, Paysafe Card and Entropay, whilst the cards you can go for are Visa and MasterCard. What’s coolest is that all of the options are available for both wagering and withdrawing. Deposits are as per usual instantly processed, whereas withdrawals vary in time taking to fully go through. Ewallets have a timeframe of 72 hours, which can be faster if we are being honest; the cards will let you have you money within 5 days. The slowest to pull through are wire transfers, typically lasting between 4 and 7 working days. The least you can withdraw is £5, and there are no restrictions on how much you are allowed to withdraw. The only exception is winning one of the on-site jackpots. The currencies you can utilise here are British pounds sterling, Euros and American dollars. When you need help, Sundae Bingo Casino’s customer support reps are on standby and will assist you with anything that is bothering you while playing at their online casino. There is the Instant Help feature, also known as the Live Chat, which is open 7 days a week, and whose business hours are between 10 am and 2 am. It is a minor flaw that the facility is not open 24/7, but that might change, plus you have other options at hand. There is a support email address that you can send your enquiries to, as well as the online contact form available directly on the website. In case you would like to email them, here’s the address: [email protected] In addition, there is a toll free phone number for all UK residents also working between 10 am and 2 am every single day. Give the team a call to 0800 018 3307 and get personalised assistance from one of the casino’s professional and friendly agents.